Transcatheter aortic valve implantation (TAVI) has been widely used in patients with high-risk aortic valve stenosis. Frailty is a parameter that significantly affects prognosis in cardiovascular diseases. In the clinic, the identification and validation of simple and inexpensive frailty evaluation methods are important. Our aim is to determine the importance of a simple and inexpensive clinical evaluation tool that can be used in patients with TAVI by examining the correlation between the “clinical frailty scale (CFS)” and “the psoas muscle area (PMA)”, which is a quantitative indicator of fraility. CFS was determined by clinical evaluation of 61 patients who underwent TAVI and PMA was calculated by computed tomography scan. A significant correlation was found between the CFS and PMA values of the patients in the correlation analysis (r=-0.970, p<0.001). Patients with early poor outcome had higher CFS values (6.0±0.9 vs 3.79±1.4; p<0.000) and lower PMA values (3.03±0.3 vs. 6.48±1.2; p<0.000). In short and long term prognosis of all cardiovascular diseases, frailty is an important guidance. CFS, which is clinically simple, easy-to-apply and inexpensive, is highly correlated with PMA, which is a quantitative indicator of fraility and closely related to prognosis in TAVI. Cardiovascular diseases are the leading causes of hospitalization and mortality all over the world. The number of elderly people in the society is increasing due to both prolongation in life expectancy and advances in medical and percutaneous treatments. As a result, the number of patients with cardiovascular diseases who need intervention is increasing rapidly in the society. Although there is no universal definition, fraility is the inability to maintain homeostasis by not responding adequately to biological stressors due to decrease in reserve in multiple organ systems (1). Fraility is closely related to poor endpoints such as disability, longer hospitalization and mortality (2-4). In the evaluation of fragility, single parameters and scales consisting of combinations of multiple parameters are used. The clinical fraility score (CFS) is a simple and fast method for assessing fragility and is closely related to poor outcome (5). The CFS score is rated between 1 and 9, and the higher the rating, the higher the risk of poor outcome. Sarkopenia is progressive and generalized loss of skeletal muscle mass and strength in sarcopenia and is associated with mortality and reduction in the quality of life. The Psoas muscle is one of the main muscles and the psoas muscle area (PMA) reflects the skeletal muscle state of the entire body. PMA is a predictor of early negative results in patients with transcatheter aortic valve implantation (TAVI). Shimura et al. (6) found CFS to be closely related to late-term mortality in patients with TAVI. Our aim is to investigate the correlation between PMA which is a quantitative scale and CFS which is semiquantitative scale and to reinforce the use of a simple and easy clinical scoring such as CFS with a quantitative tool in patients with TAVI. Sixty one patients who underwent TAVI between 2014 and 2017 in our clinic were included in the study, retrospectively. CFS scores which we routinely added to the anamnesis of the patients and PMA values were calculated using computed tomography (CT) which was performed to evaluate peripheral arteries in patients with TAVI. The status of the patients at the end of the first month was learned in visits or by phone. Properly measured blood pressure >140/90 mmHg or use of antihypertensive medication was defined as hypertension. Diabetes mellitus was defined as fasting blood glucose >126 mg/dL or HbA1c ≥6.5%, or oral antidiabetic or insulin use. Kidney functions were evaluated using The Chronic Kidney Disease Epidemiology Collaboration equation. The presence of coronary artery disease was determined using medical records. Smoking was defined as smoking at least one cigarette per day for the last 1 year. The CFS score was first described by Rockwood et al. (3,7) and then it was modified. Meanings of 1-9 scores were as follows: 1 very fit (people who exercise daily, are energetic and are active compared with their cotemporaries), 2 well (people who have no active disease symptoms but are less fit than category 1), 3 managing well (people with comorbid diseases whose symptoms are less than category 4 under treatment), 4 vulnerable (people who have complaints despite medical problems are well controlled, but they are not dependent on others), 5 mildly frail (people depend mildly on others in daily activities), 6 moderately frail (people depend on others in daily activities and in non-daily activities such as climbing stairs), 7 severely frail (people depend on others in all forms of activity but are stable and risk of death is not high), 8 very severely frail (people who are so frail and have a high risk of death, even there is a minor disease), 9 terminally ill (people with a life expectancy <6 months) (7). PMA measurements were obtained by dividing the sum of right and left PMAs obtained from single axial CT images at L3 vertebra level by the body surface area. For biochemical analysis, blood samples were taken after 12 hours of fasting and analyzed in the first two hours. Our study was retrospective, so no informed consent from patients and Ethics Committee approval were taken. Statistical analyses were done with the Statistical Package for the Social Sciences version 17.0 (SPSS, Chicago, Illinois) program. Continuous variables with normal distribution were expressed as mean ± standard deviation and continuous variables without normal distribution were expressed as median (interquartile range). Categorical variables were expressed as percentages. Categorical variables are compared between groups by chi-square test. Kolmogorov-Smirnov test was used to determine whether continuous variables have normal distribution. Continuous variables with normal distribution were compared between groups by Student t-test and without normal distribution by Mann-Whitney U test. Correlation between two variables was calculated by Pearson correlation test. The results were evaluated in 95% confidence interval and p<0.05 was considered statistically significant. Sixty one patients with TAVI were included in the study. The mean age was 76.2±8.3 years and 34 (55.7%) of them were male. Other demographic and laboratory data were summarized in Table 1. Continuous variables were expressed as mean ± standard deviation and categorical variables were expressed as n (%). Death in 30 days as early poor outcome was encountered in 2 (3.3%) patients, 3 had (4.9%) stroke and 7 (11.5%) had vascular complications in the site of intervention. 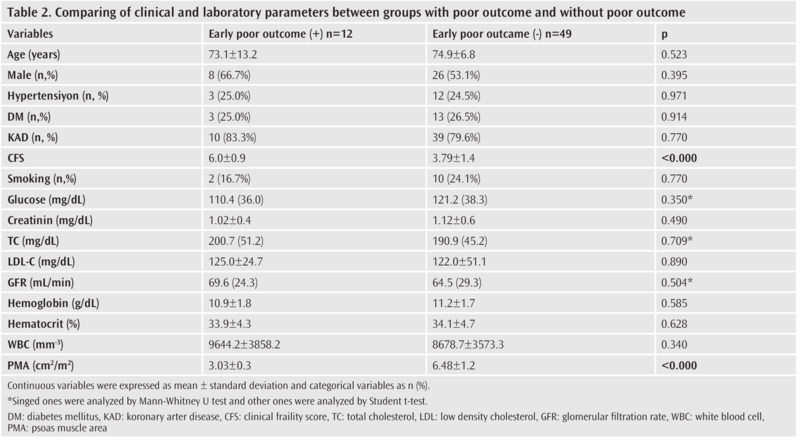 CFS was higher in patients with early poor outcome than in patients without early poor outcome (6.0±0.9 vs 3.79±1.4; p<0.000), PMA was lower in patients with early poor outcome than in patients without early poor outcome (3.03±0.3 vs 6.48±1.2; p<0.000) (Table 2). 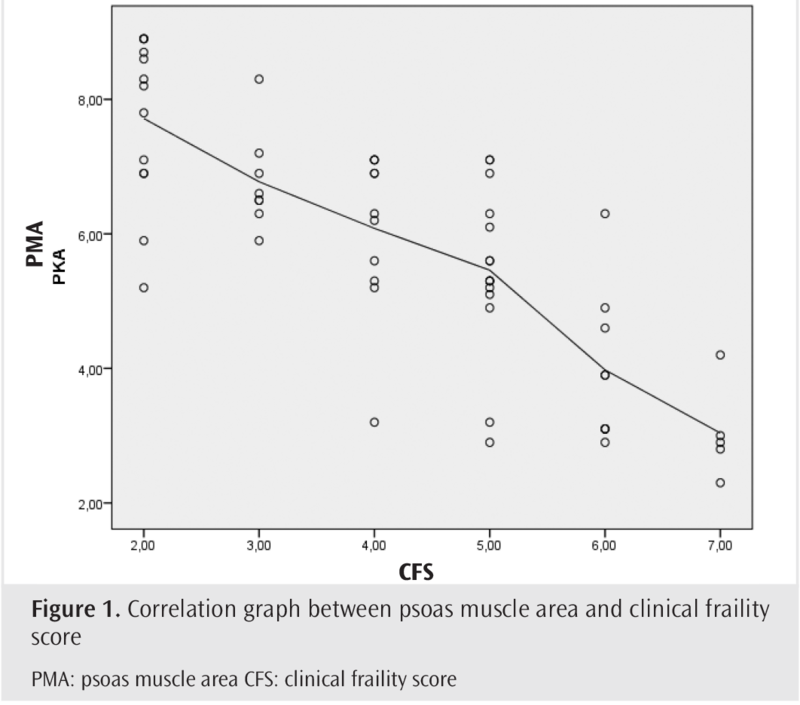 There was a strong and negative correlation between CFS and PMA values (r=-0.794, p<0.000) (Figure 1). Significant correlation between the PMA, which is the quantitive indicator of TAVI, and CFS, suggests that CFS can be used to predict prognosis in patients with TAVI. Fraility is characterized by increased sensitivity to stressors due to decrease in physiological reserve and functional capacity and is closely related to hospitalization and mortality. It is associated with increased postoperative complication frequency in general surgery operations (8). Factors such as lipoprotein accumulation and chronic inflammation in the pathogenesis of aortic valve calcification play a role. Although it has a relationship with aging, we cannot provide adequate information for the prognosis of aortic valve patients only with age. In heart surgery, EuroScore and Society of Thoracic Surgeons scores are the most frequently used scores to determine operative mortality. However, these models have been developed for heart surgery and also have suboptimal predictability in high-risk patient groups. Fraility is an important parameter in determining short-term complications and prognosis in patients with TAVI whose frequency is increasing nowadays. The most common method for assessing fraility is eye-balling, but it is weak in terms of objectivity and reproducibility. Although there are many fraility scores and scales, they are not only time consuming and complex, but also are not objective methods. Although the parameters based on daily life activity measurement and exercise capacity such as 5-minute walking test show morbidity and mortality, there is not enough measurement performed due to orthopedic problems in the elderly population (9,10). Rodes-Cabau et al. (11) found fraility as a predictor of 2-year mortality rate, regardless of other risk factors. However, eye-balling method was used in this study. Green et al. (12) showed a close relationship between parameters including albumin, daily life activities and walking speed and 1-year mortality rate in 159 patients with TAVI. Therefore, we used PMA in our study to determine fraility more accurately and quantitatively. However, since PMA is not a parameter that can be obtained in every patient, we examined the relationship between CFS and PMA and found a close correlation between them. Thus, we showed that a cheap variable that can be obtained easily in anamnesis can be valuable in predicting prognosis in patients with TAVI. This study was performed in one center with relatively small sample size, which were the limitations of the study. Also, other fraility scores, 5-minute walking test, handgrip maneuver and cognitive function tests were not used in this study. Author Contributions: Concept - G.D.; Design - M.M.C. ; Supervision - E.B. ; Resources - İ.A. ; Data Collection and/or Processing - G.D., F.E.G. ; Analysis and/or Interpretation - G.D.; Literature Search - G.D.; Writing Manuscript - G.D.; Critical Review - E.B., M.M.C. Xue QL. The frailty syndrome: definition and natural history. Clin Geriatr Med 2011; 27: 1-15. Fried LP, Tangen CM, Walston J. Cardiovascular Health Study Collaborative Research Group. Frailty in older adults: evidence for a phenotype. J Gerontol A Biol Sci Med Sci 2001; 56: M146-56. Rockwood K, Howlett SE, MacKnight C, Beattie BL, Bergman H, Hébert R, et al. Prevalence, attributes, and outcomes of fitness and frailty in community-dwelling older adults: report from the Canadian study of health and aging. J Gerontol A Biol Sci Med Sci 2004; 59: 1310-7. Ensrud KE, Ewing SK, Taylor BC, Fink HA, Cawthon PM, Stone KL, et al. Comparison of 2 frailty indexes for prediction of falls, disability, fractures, and death in older women. Arch Intern Med 2008; 168: 382-9. Wallis SJ, Wall J, Biram RW, Romero-Ortuno R. Association of the clinical frailty scale with hospital outcomes. QJM 2015; 108(12): 943-9. Shimura T, Yamamoto M, Kano S, Kagase A, Kodama A, Koyama Y, et al. OCEAN-TAVI Investigators. Impact of the Clinical Frailty Scale on Outcomes After Transcatheter Aortic Valve Replacement. Circulation 2017; 135: 2013-24. Rockwood K, Song X, MacKnight C, Bergman H, Hogan DB, McDowell I, et al. Aglobal clinical measure of fitness and frailty in elderly people. CMAJ 2005; 173: 489-95. Afilalo J, Eisenberg MJ, Morin JF, Bergman H, Monette J, Noiseux N, et al. Gait speed as an incremental predictor of mortality and major morbidity in elderly patients undergoing cardiac surgery. J Am Coll Cardiol 2010; 56: 1668-76. Inouye SK, Peduzzi PN, Robison JT, Hughes JS, Horwitz RI, Concato J. Importance of functional measures in predicting mortality among older hospitalized patients. JAMA 1998; 279: 1187-93. Rosenhek R, Iung B, Tornos P, Antunes MJ, Prendergast BD, Otto CM, et al. ESC Working Group on Valvular Heart Disease Position Paper: assessing the risk of interventions in patients with valvular heart disease. Eur Heart J 2012; 33: 822-8, 828a, 828b. Rodes- Cabau J, Mok M. Working toward a frailty index in transcatheter aortic valve replacement: amajor move away from the ‘eyeball test’. JACC Cardiovasc Interv 2012;982-983. Green P, Woglom AE, Genereux P, Daneault B, Paradis JM, Schnell S, et al. The impact of frailty status on survival after transcatheter aortic valve replacement in older adults with severe aortic stenosis: a single-center experience. 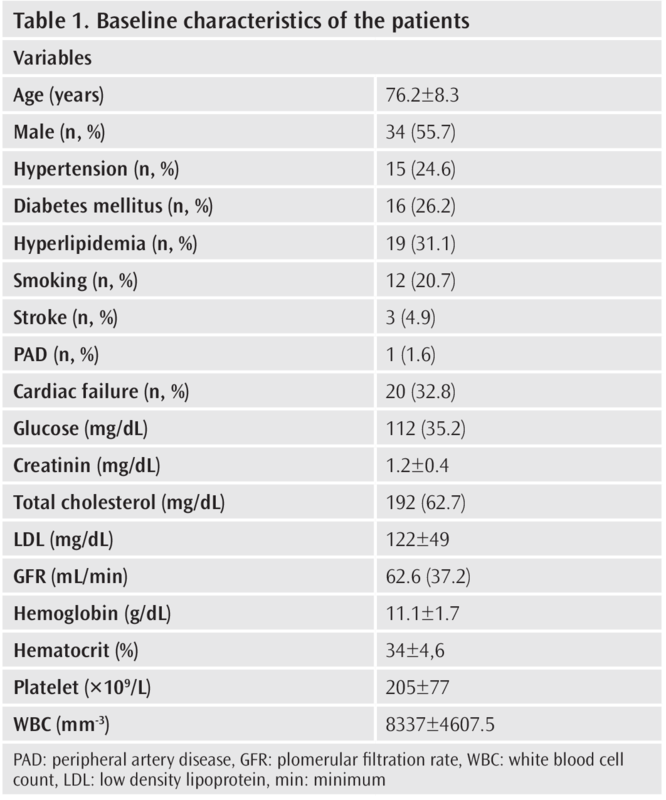 JACC Cardiovasc Interv 2012; 5: 974-81. Green P, Arnold SV, Cohen D, Kirtane AJ, Kodali SK, Brown DL, et al. Relation of frailty to outcomes after transcatheter aortic valve replacement (from the PARTNER trial). Am J Cardiol 2015; 116: 264-9.